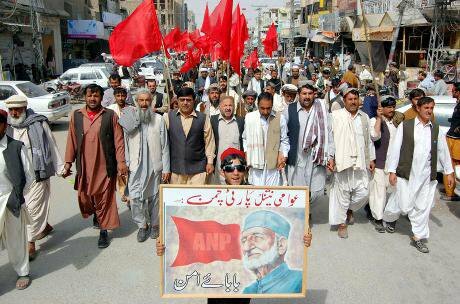 An ANP protest in Balochistan against targeted killings--new law could be used there. Demotix / ppiimages. All rights reserved.A contentious piece of legislation, the Protection of Pakistan Ordinance (PPO), was rushed through the National Assembly on the night of April 7th. It has kicked up a country-wide controversy. The government wants to put the measure before the Senate (the upper house), without which it cannot come into force, in a session beginning on April 14th. Almost all opposition parties, including the Pakistan People’s Party (PPP)—third largest in the Senate—have vowed to resist it. The Pakistan Tehrik e Insaf (PTI) trumped other parties on April 9th when a pro-PTI lawyer, Mehmood Akhtar Naqvi, petitioned the Supreme Court against the proposed legislation, calling it “a blow to the fundamental rights of the citizen”. Citing protests by major parties in the lower house and their eventual boycott of the session in which the government used its majority to pass the law, Naqvi argued that the PPO would arrogate judicial powers to the executive, in contravention of a 1996 decision by the court. The right to a fair trial would be snatched from the citizen, he said, declaring this “black law” incompatible with fundamental rights in the federal constitution. Mian Raza Rabbani, who leads the 39-strong PPP group in the 100-member Senate, expressed serious reservations the next day. Opponents contend that the PPO would give security agencies licence to exercise their powers indiscriminately, while helping them escape the embarrassment of public accountability. Though divided, all parties outside the government—the PPP, the Awami National Party (ANP), the Muttahida Qaumi Movement (MQM) and the Pakistan Muslim League-Quaid (PML-Q)—have deemed the proposed legislation draconian. As a presidential decree, the PPO can be likened to the US Patriot Act in granting excessive powers to law-enforcement agencies. The proposal was floated last October, although receiving little attention at the time. The pretext was the Taliban Islamist insurgency, particularly in north-west Pakistan, which has led to more than 51,000 deaths since the country became a partner in the US-led “war on terror” in October 2001. This includes more than 5,000 security personnel—more than Pakistan lost in its three wars with India, between 1965 and 1999, altogether. The ordinance would allow arrests and detentions on suspicion of threat to “national security”, with special courts and procedures for the suspects. The burden of proof would shift from the state to the defendant, who under section 14 would be guilty until proven innocent. This section alone would ensure the law violated the federal constitution (chapter 11), as well as international law—this in a country where the police are regarded as corrupt, inefficient, excessive and often in violation of the law themselves. Section 19 would meanwhile remove the right of remedy from the innocent and reparation from those wrongly convicted, as the security agencies could not be held accountable for any action undertaken in “good faith”. Section 9 of the PPO would protect the state in withholding information on the whereabouts of suspects under interrogation. The independent Human Rights Commission of Pakistan (HRCP) said the ordinance would give the security forces absolute power and legitimise “safe houses” they use for interrogations—previous laws required them to justify 90-day detention, whereas the PPO would free them of such restriction. Critics further argue that the ordinance, rather than focusing on the Taliban, could be deployed against the raging insurgency in Balochistan in the south-west. In a recent amendment through Statutory Regulatory Order (SRO), the Interior Ministry gave the Federal Investigation Agency, the police and the Balochistan levies (a paramilitary force in the province) power to take any action required to tackle militancy—an effective carte blanche for the security forces which could lead to a culture of impunity. “The country faces an unusual situation and requires unusual tools to fight the crisis of insecurity,” the federal information minister, Pervez Rasheed, told the Pakistan media on April 9th. But in a country where several hundred people have gone missing with their cases pending before senior courts, the PPO appears as yet another tool of oppression: the police and the Inter-Services Intelligence agency are already prime suspects behind these enforced disappearances. Even if the ordinance were to be used by the Pakistan army in a major offensive against Islamist militants ensconced in the north-western mountains, the measure would allow it to do so unregulated and unchecked. The Anti-Terror Act 2013 already provides the various arms of law enforcement considerable powers to pursue and prosecute alleged terrorists. It also however provides protection to witnesses and judges in such cases, and families of people who go missing or are detained under the act have mounted legal challenges by which the government evidently feels constrained. The government may now however be constrained by the threat of imminent defeat in the Senate—unless it waters the ordinance down.